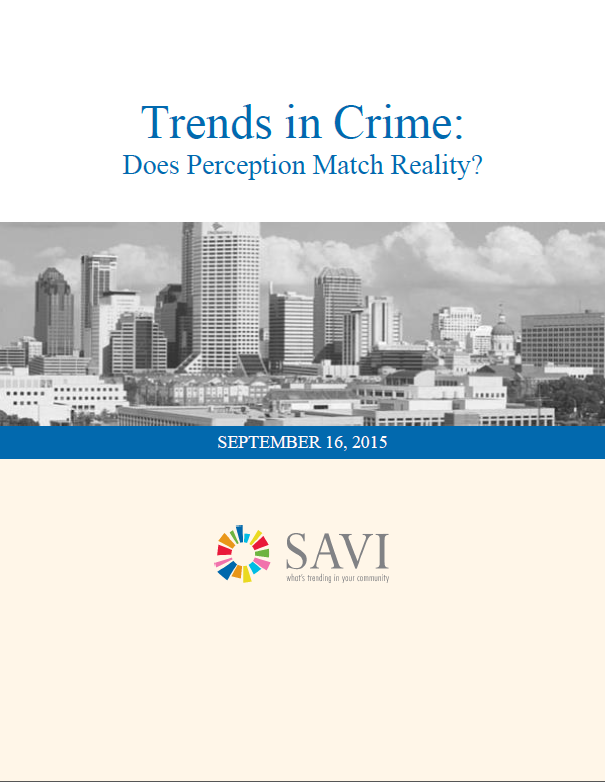 Many factors contribute to our perceptions of crime. News stories, types of crime committed, location of crime—these elements and others help to shape the way we perceive the safety of our communities. Frustrated with a summer of violence. Surge of violence in Indianapolis. Often local crime headlines tell a story of an increasingly violent Indianapolis, but does perception match reality? Crime and public safety are important social and political issues faced by cities and communities across the country. Contrary to public perception, over the past two decades crime rates across the United States have decreased dramatically (Wolfers, 2014; McCarthy, 2015; Lopez, 2015). In 1994 the national Part I crime rate (the combination of property and violent crime) was 53 crimes per 1,000 people. In 2013, the rate was 31 crimes per 1,000 people, a decline of 41.5 percent. Yet, the story has not been the same across the country. When examining trends in crime at different geographic areas, such as counties, cities, or neighborhood the story becomes more complicated. On January 1, 2007, the City-County Council consolidated the Indianapolis Police Department and Marion County Sheriff’s Department in the Indianapolis Metropolitan Police Department. The change, conceived to reduce expenditures, meant that the IMPD would be responsible for policing a larger geographic area. Studying crime trends in the Indianapolis Metropolitan Police Department (IMPD) jurisdiction reveals a more nuanced story. Overall, the crime rate is at the lowest level since 2007. Property crime and simple assaults, in particular, dropped significantly. Over the same period, however, violent crime has increased, especially since 2011. Yet the possibility of becoming victim of crime is not the same for everyone. Examining the geographic distribution of crime shows wide variation from place to place. Part I crime rates range from a low of 2.6 per 1,000 residents in the Cumberland neighborhood on the eastern edge of the city to a high (excluding Lafayette Square) of 202 in Downtown Indianapolis. In this report, we explore the trends in crime rates in the 94 neighborhoods and 201 census tracts within the IMPD service area from 2007 to 2014. All crime rates have been calculated based on 2010 population data and represent the number of crimes per 1,000 people. As a result, some of the crime rate figures may differ from other published sources. Data is drawn from the Indianapolis Metropolitan Police Department, which does not serve the Airport, Speedway, Beach Grove, and Lawrence areas. The Park 100 neighborhood was removed for statistical and mapping purposes.